Like most other devices that measure water in hydrocarbons, the SeCaP sensor takes advantage of the huge difference in electrical properties (i.e. the permittivity) between water and hydrocarbons. SeCaP is a single electrode capacitance probe – unlike other capacitance type water-in-oil monitors, which always use electrodes in pairs. With the SeCaP sensor, the “other electrode” is moved infinitely away from the physical electrode. The measured fluid effectively absorbs the emitted alternating charge from the single electrode, similar to the way soil (earth) absorbs the huge charge when lightning strikes. To avoid the common problem of short-circuiting the electrodes when the measured fluid is water-continuous, the SeCaP electrode is isolated and protected behind an extremely robust ceramic disk. This allows Sentech AS to distinguish and quantify the concentrations of water at specific levels or locations, e.g. in a separator or in a large pipe with poorly mixed flow. Permittivity can be described as the ability of a material to store (“permit”) an electric charge, and thereby resist or prevent the generation and propagation of an electric field. This basically means that with water in front of the SeCaP electrode, the capacitance is 80 times larger than it is with gas – and 40 times larger than with oil. This huge difference is the reason why permittivity is such a good measurement parameter for distinguishing water from hydrocarbons. 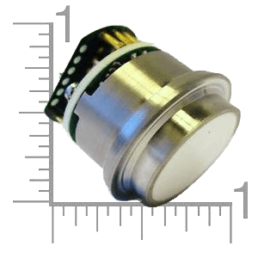 The SeCaP sensor includes an embedded oscillator, in which the single electrode capacitor forms part of the RC circuit. As the medium in front of the sensor changes, so does the RC time constant and thus also the resulting resonant frequency of the circuit. Keeping the electronics this close to the capacitance electrode minimizes the effect of parasitic capacitances of cables and surrounding space and materials. The SeCaP sensor also includes an on-board temperature sensor, which allows the Controller Unit to correct for changes both in circuitry and process temperature. The oscillator is configured to resonate at around 20 MHz with air in front of the sensor, for which the software is calibrated to generate a “SeCaP value” of 0. With typical process water in front of the sensor, the software is calibrated to generate a SeCaP value of 1000. In actual operation, the SeCaP sensor will always generate a value between these two extremes. The measured SeCaP value is then used to calculate the mixture permittivity, and further the % Water relative to the total volume oil, gas and water, or to detect gas and foam in separators. The water molecule (H2O) is bipolar, i.e. it responds (flips) when exposed to an alternating electric field. This means that it is taking up a charge and delaying the propagation of the electric field. This gives water its high permittivity. 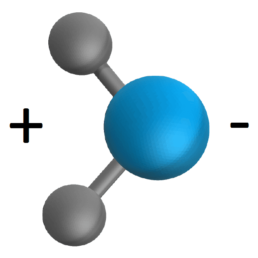 Hydrocarbon molecules (hexane C6H14 shown here) are symmetrical and barely affected by an electric field. Thus they impact very little on the propagation of the field – i.e. have a low permittivity. Do you have any questions about our technology?